Manchester United’s win against Blackpool on Sunday and other victories during 2010-11 have helped them extend their lead at the top the Premier League all-time table (published in full below). United have been one of seven ever-present teams in the League’s 19 completed seasons. They have won 1,574 points from 734 games at an average rate of 2.14 points per game. They are the only team who have averaged more than two points per game. The other ever-present teams are Arsenal, Chelsea, Liverpool, Aston Villa, Tottenham and Everton – and those six lie in that order behind United in the all-time table. 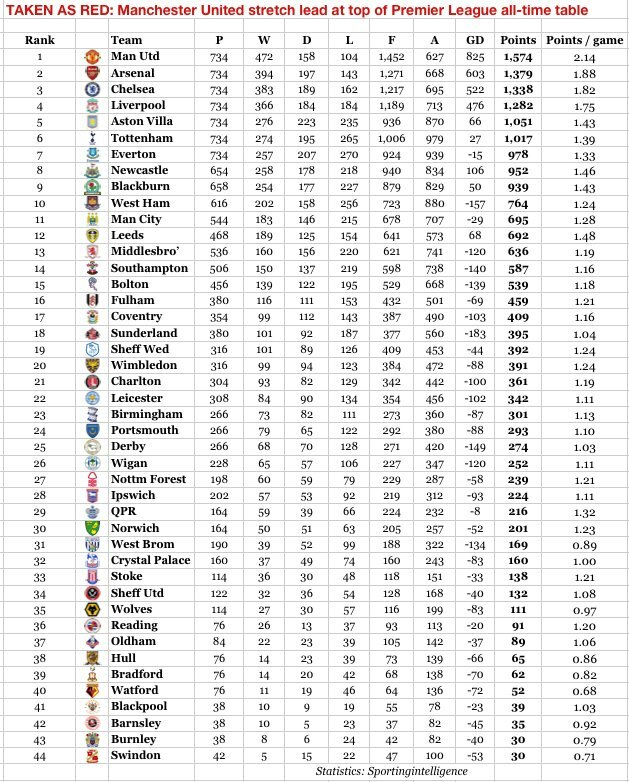 The traditional ‘big four’ of the Premier League era (United, Arsenal, Chelsea and Liverpool) are joined in having more than 1,000 points only by Villa (1,051) and Tottenham (1,107). Everton need 22 points next season to reach that landmark. United, Arsenal, Chelsea, Liverpool and Tottenham are the only teams to have scored more than 1,000 Premier League goals. Another landmark to watch for next season is Tottenham becoming the first Premier League team to concede 1,000 goals. They have 21 more goals to go to reach that unwanted tally, and on current trends, that is likely to happen during their 16th game of next season. There have been 44 different teams in the Premier League since England’s top division was revamped for the 1992-93 season, and Swindon lie 44th in the all-time table (with 30 points from their 42 games). Next season they will be playing in League Two, joining Bradford (No39 in the all-time table). If we were to formulate next season’s Premier League with the top 20 teams in the all-time top 20, the ever-present seven would be joined by Newcastle, Blackburn, West Ham, Manchester City, Leeds, Middlesbrough, Southampton, Bolton, Fulham, Coventry, Sunderland, Sheffield Wednesday and Wimbledon. Of course, West Ham will be in the Championship next season, with Leeds, Boro, Saints and Coventry, while Wednesday will be League One again. And Wimbledon do not exist any more. A team called MK Dons took their place in the Football League some years ago, while their spiritual selves were reincarnated in the form of AFC Wimbledon, who will play in League Two next season after promotion from the Conference. If points per game is a good indicator of the long-term strength of a club, then Leeds (1.48 points per game) and Newcastle (1.46 points per game) leapfrog a few places each to be the closest challengers to the trad Big Four, with Villa and Blackburn (1.43 points per game each) on their heels, and Tottenham (1.39) and Everton (1.33) completing the Big Ten. The future may be Manchester City’s – if you listen to Eastlands optimists – but as things stand, they’re only the 11th best team in Premier League history (in total points), and the 12th best in points per game.